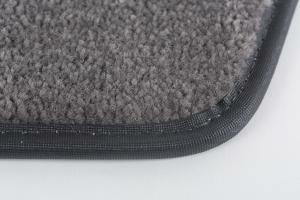 A solid edge treatment is the key to a finished, clean looking snap-in boat mat. There are four basic options to choose from but most companies choose to offer only one. Once you gone through the steps of selecting the carpet style and color, confirming the shape and fit of the template, there is one final choice to make: the type of edge treatment or binding. A finished edge is important to prevent fraying and to keep the mat intact. You never want to leave a raw, exposed edge of cut carpet because eventually the carpet will come apart. Typically the edge finish color is chosen to match the carpet as closely as possible. However for those that dare, the edge can be done in a contrasting color to match seat piping, gel graphics or some other element in the boat – it will completely change the look of the mat. 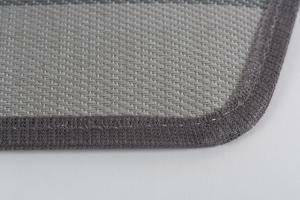 The four most common options for binding are web fabric, vinyl, canvas (such as Sunbrella®) or yarn serged. Eshco is the most known brand of web fabric binding and is usually the most economical option. It is used because it can be sewn easily. However, the downside to web binding is that it does not have the resiliency other binding options provide. Vinyl and Sunbrella are the next step up and are the industry standard. Both of these binding choices provide a clean, durable edge suited to last in the marine environment. Lastly, the highest quality edge finish is serged yarn – typically this is done from the same yarn as the carpet is produced from. Serging offers the cleanest, most coordinated edge treatment possible. Few companies have the equipment, materials or the skilled personnel to offer a serged edge so it is not as common as the other choices. Corinthian Marine carpet offers all four edge treatment choices to our customers so really it is up to you and your budget.